This woodcut engraved caricature was used as a frontispiece to the 1776 edition of Freebetter’s New England Almanack. It is a copy of an English caricature entitled The able doctor, or America swallowing the bitter draught which was originally published in the London Magazine in 1774. The American artist has reversed the image and deleted the Earl of Bute, who is shown standing at the far right of the English edition, carrying weaponry which symbolises the imposition of martial law on the unruly colonists. Almanacs were extremely popular during the eighteenth-century, with annual sales in England exceeding the total of all other publications combined. As a such they were also one of the few forms of publication to be regularly bought by people drawn from the lower and middling ranks of the social spectrum. The almanac’s popularity was derived from its utility and low retail price. 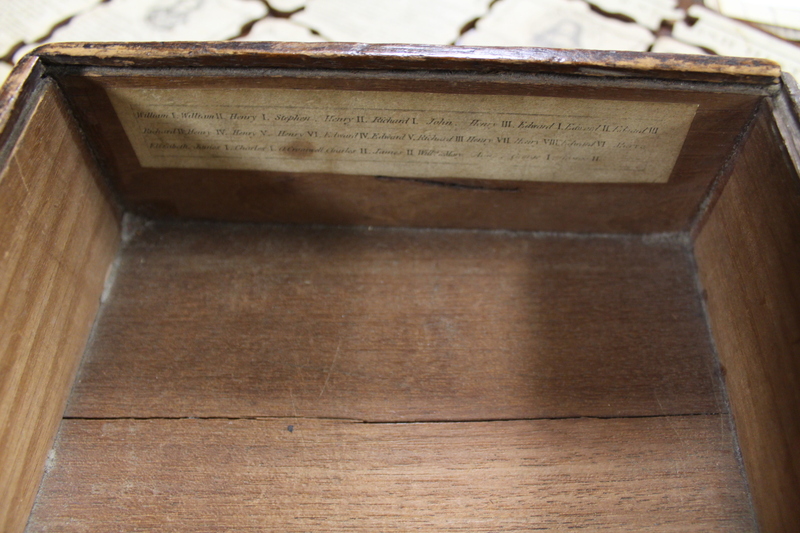 For a few pence, customers were able to purchase a pocket-sized book which simultaneously served as a calendar, diary, reference book and source of entertainment. The core function of the almanac was an agricultural calendar which also carried feast days, holidays and other notable events. However from the 1730s onwards, publishers began to insert useful articles on subjects ranging from health to astrology, stories, travel information, and conversion charts. 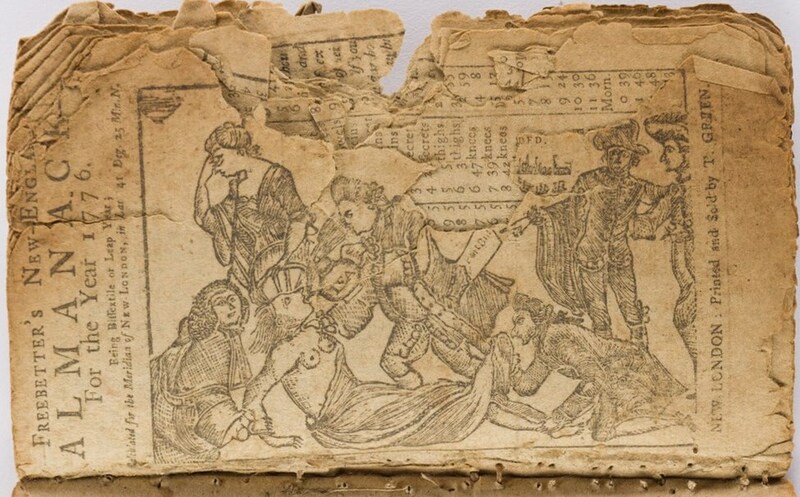 Sadly few of these publications have survived and the relatively poor quality of the materials used to make them means that those which have are often in poor condition. Americans inherited the English obsession with the almanac, with the first domestic edition being published in Cambridge Massachusetts in 1639. By the time the Revolution broke out in 1775, the American colonies boasted dozens of domestically produced titles with annual circulation figures likely to have been in the high tens or low hundreds of thousands. Freebetter’s New England Almanack was published by Timothy Green in New London, Connecticut, between 1772 and 1792. Green was a prolific publisher of all manner of printed materials and its possible that he also sold imported English books and prints. This would certainly explain how he was able to obtain a copy of a caricature from the London Magazine. It’s an interesting reminder of the geographic and social spread of English caricatures in this period. This is one of a set of twelve American almanac titles published between 1776 and 1784 which are being offered up for sale in a US auction next month. They carry an estimate of $800 – $1,000 (£650 – £850), which seems reasonable given that a number of online dealers are currently asking around $600 for an individual 1770s edition of Freebetter’s… For more on the English almanac trade see James Raven, Publishing Business in Eighteenth-Century England, Woodbridge, 2014. pp. 201 – 205. View of an intaglio printer’s workshop during the early years of the nineteenth-century. The technology and process of printing from copper changed remarkably little during the 300 years before the introduction of lithography. Albrecht Durer (1471 – 1528) could have walked into a printer’s workroom in 1800 and understood most of what was happening around him. I’m currently reading Anthony Griffith’s wonderful new book on printmaking in Europe between 1550 and 1820. I can’t recommend it highly enough to historians and fellow print-enthusiasts; Griffith’s draws on source material gathered from across Europe to piece together an incredibly detailed and revealing account of the business of making and selling printed images in this era. 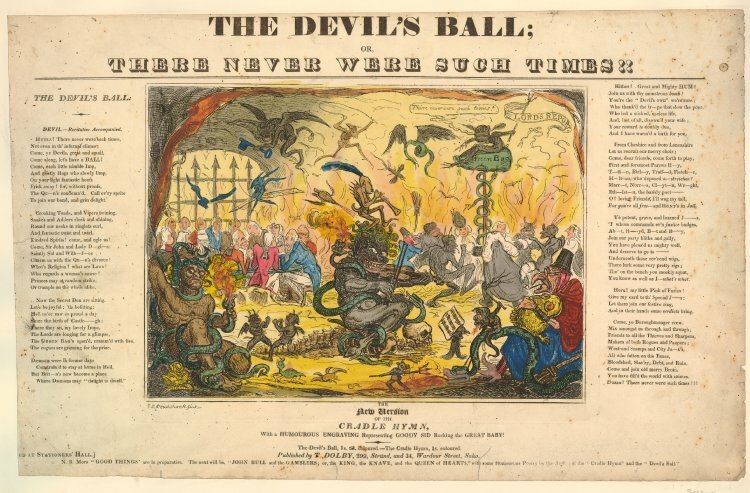 And whilst much of his analysis focuses on the very top end of the market for prints, I’ve inevitably found myself wondering whether his work could be used to draw more specific conclusions about the nature of the satirical print trade in Britain during the eighteenth-century? 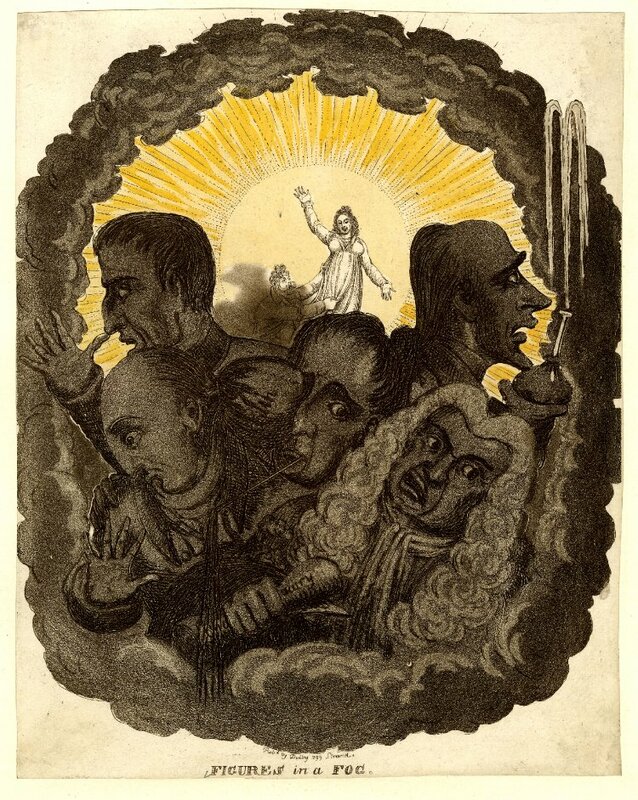 What follows is something of a thought experiment in which I attempt to use Griffith’s work on the cost of printmaking and the profit margins of publishers to see if I can come up with a rough estimate of how much it might have cost to publish a caricature print in London at the end of the eighteenth-century . 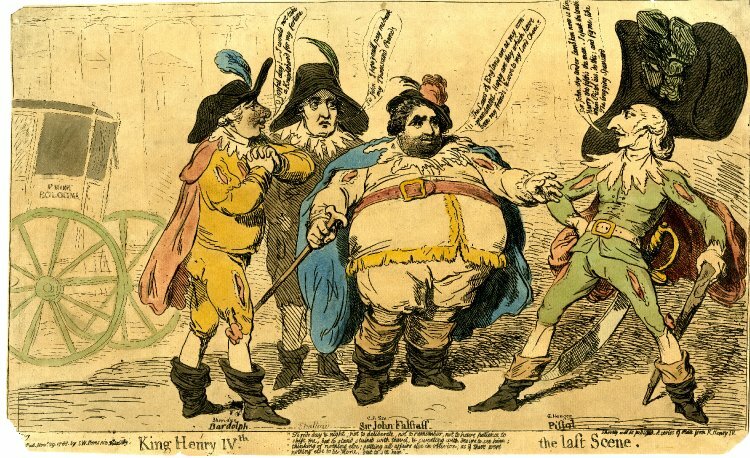 The print in question is James Gillray’s King Henry IVth the last scene, published by S.W. Fores in November 1788, and I’ve chosen it purely because Gillray’s original bill survives and we know that he was paid £2 2s for engraving the plate . With this important first piece of the puzzle in place, we can start to draw on Griffith’s work to see what other costs Fores may have incurred in bringing the finished print to the marketplace. So let’s start with the copperplate on which the design would have been engaved. 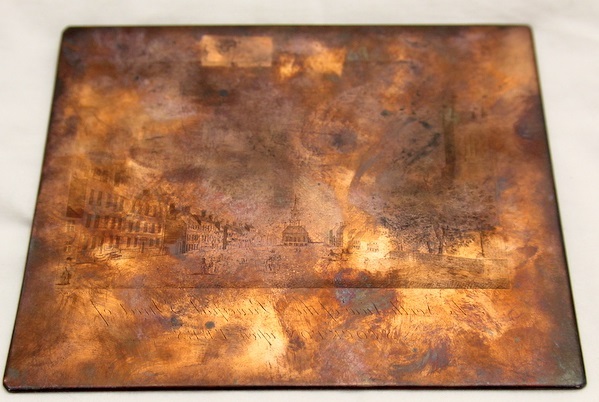 Griffith’s looks at the cost and dimensions of a number of plates published in London throughout the eighteenth-century and concludes that a ratio of 1s 1d per 100cm2 of copper seems to have been maintained consistently between 1700 and 1820. The British Museum’s copy of King Henry… measures 25 x 41cm, but it has been trimmed quite closely to the borders of the image and therefore these dimensions need to be enlarged slightly to take account of the plate’s original borders. If we add 5-6 cms onto the edges of the print then the total size of the plate is likely to have been something in the region of 31 x 46cm, or 12 x 18 inches. If Griffith’s cost ratio is correct, a plate of this size would have cost Fores approximately 15s to purchase. Paper would have been the next item on Fores’ shopping list, as the publisher was typically expected to supply the printer with the quantity, size and quality of paper that he or she deemed necessary. The paucity of domestic paper production had meant that good quality printing paper had to be imported from France and Holland for much of the eighteenth-century, but by the 1780s Fores would have been able to secure good quality domestic paper from one of a number of wholesalers and manufacturers in and around London. 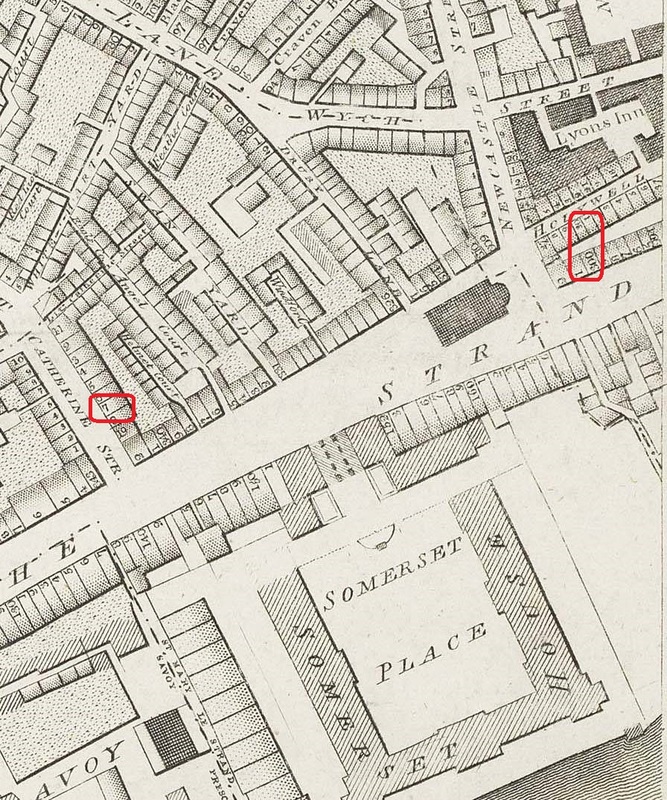 One of these was the paper merchant James Whatman, whose watermarks appear on a number of prints published by Fores during the 1790s . Whilst we don’t know exactly how much Whatman was charging Fores for his paper in 1788, a copy of one of the papermaker’s bills from 1775 indicates that a ream of his best paper would have cost £3 10s at that time. A ream of paper would have contained 480 – 500 sheets (let’s say 500 to keep things simple), with a typical sheet measuring 32 x 42cm. 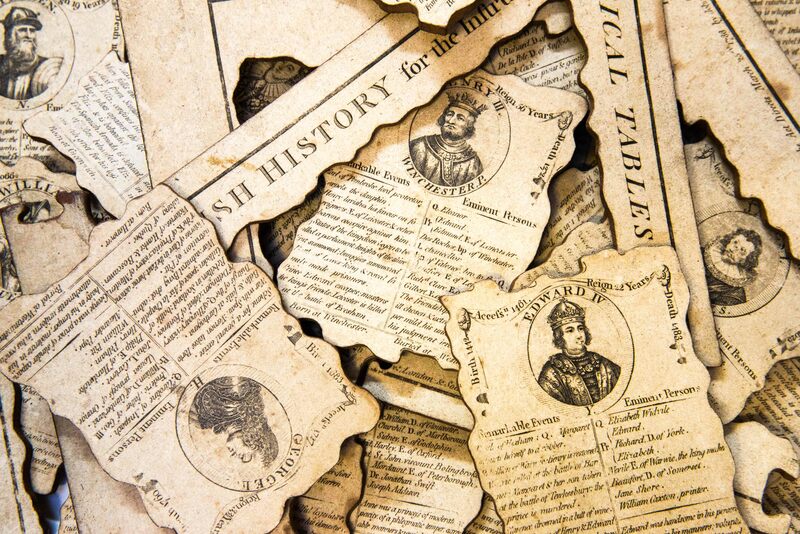 That means Fores could reasonably expect to print 500 copies of King Henry… from every ream of paper purchased, with minimal waste being left over at the end of the process. Fores would then need to take the finished plate and his paper to a printer. It’s possible that he owned his own press and employed a printer in house, but this seems rather unlikely given the sporadic nature of his publishing output and the relatively small size of the premises from which he was operating at this point in his career. Indeed Griffith’s argues that comparatively few publishers kept printers on their staff and most would have contracted such work out to printing houses that had the requisite skills and equipment to do the job. Volume was the main determinant of cost when printing, although it seems reasonable to assume that a publisher would have had to pay more if the project involved something difficult or out of the ordinary, such as adding different colours to a plate or printing an unusually large design. Griffith’s calculates that printing costs were typically 25% higher than the cost of the paper being used, so Fores would have been charged somewhere in the region of £4 8s to make 500 impressions on a ream of paper costing £3 10s. 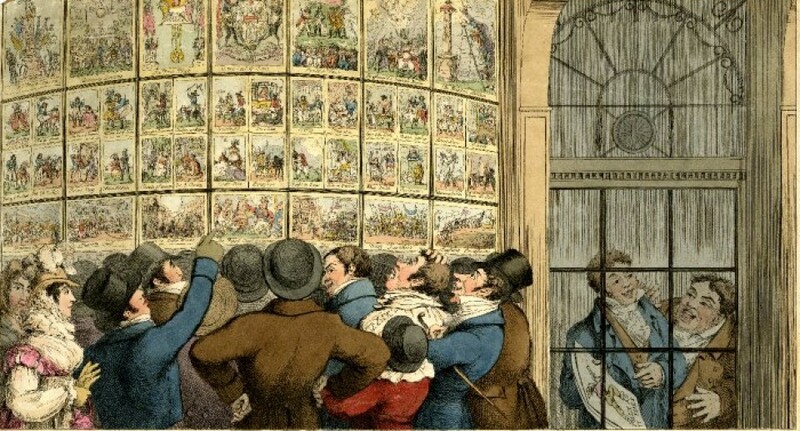 Once the bundles of finished prints were returned from the printers, Fores would then have to decide how many copies he wanted to have coloured before they were put on sale. Griffith’s claims that the greater part of a publisher’s stock was always made up of coloured prints, which I find somewhat surprising given that this potentially increased the size of any losses incurred from unsold prints. I can only assume that comparative demand for coloured and uncoloured prints was such that printsellers believed that this was a risk worth taking. Colouring was also relatively inexpensive to apply, typically costing 1d per print, whilst typically adding 6d – 1s to the retail price of the finished item. So for the sake of argument, let’s assume that Fores had the entire 500 sheet run of King Henry… coloured and therefore had to pay his colourists a combined total of about £1 17s for their work. 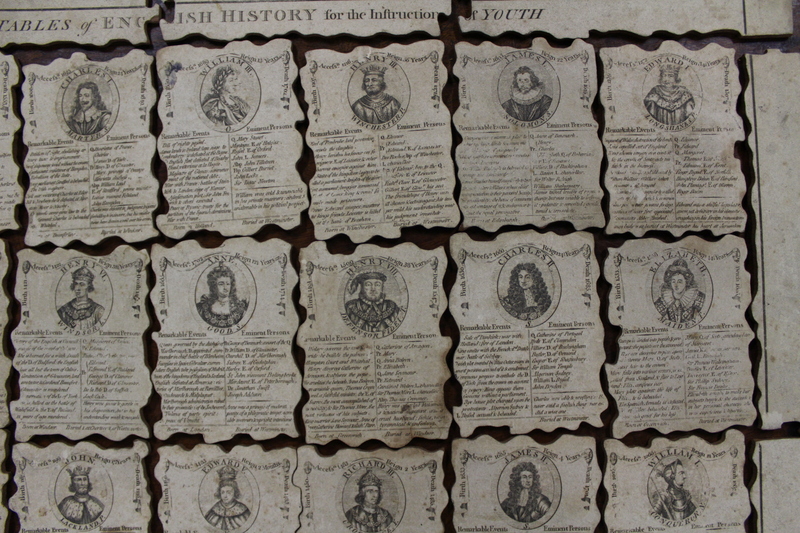 How many copies of King Henry… would Fores have to sell in order to break-even? Here’s where things get slightly tricky, as no evidence of the retail price survives and the price of other caricatures Fores published around the same time varied considerably. 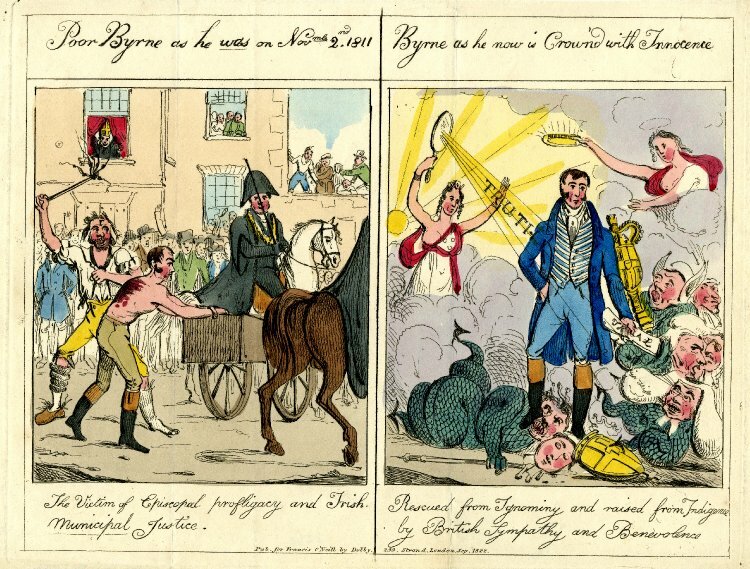 In January 1788, Fores had sold another plate by Gillray for 1s, but this was a smaller boxing-related print which may not be comparable to a larger caricature. Similarly, we know that Fores charged 3s 6d for copies of Isaac Cruikshank’s The Rout which was published some two years after our print, but that was an unusually long caricature and may therefore have warranted a higher-than-average retail price. 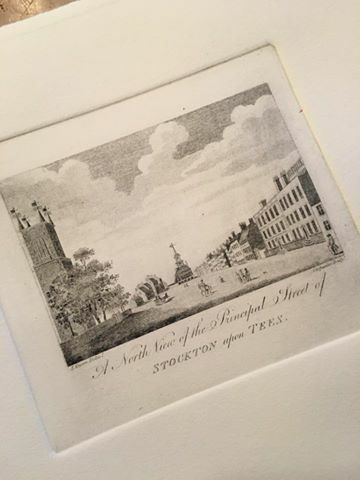 So let’s assume that copies of this print sold for 2s, which is broadly comparable to the price Fores charged for two caricatures on the Prince Regent that he had published in 1786 . If Fores sold King Henry… at 2s per copy then he would have had to sell 124 coloured copies, or 25% of every 500 copies printed, to break-even. Assuming he managed to sell every copy printed, then he stood to make a total profit of £37 10s per 500 prints published. So what, if anything, does all this tell us about the business of making satirical prints? For me it highlights two things: Firstly, it demonstrates that there was reasonable money to be made from publishing caricatures. Fores’ profit on every 500 prints sold would have been more than double his initial investment and was comparable to the average annual wage for an unskilled labourer. 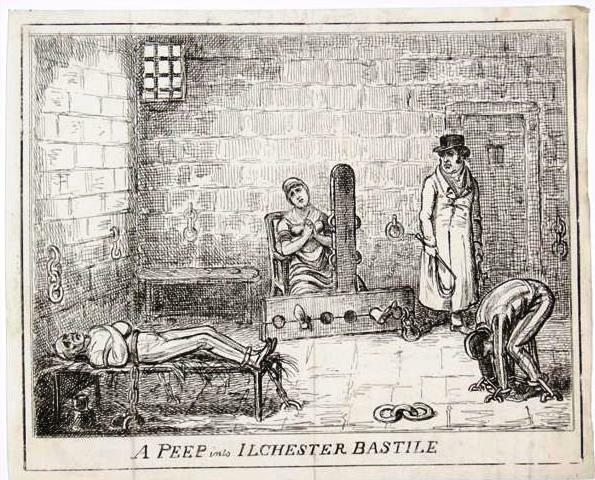 As such it is perhaps easy to see why successful publishers such as John Boydell and Thomas Tegg managed to amass considerable fortunes on the back of publishing and selling prints. Secondly, our little experiment also indicates the potential cost of getting things wrong. The publisher faced considerable up-front expenditure to bring a new caricature to market and bore all of the financial risk if things went wrong. Success in printselling must in part have been based on one’s ability to accurately forecast sales and set production levels accordingly. Print too many copies and your profit margin would evaporate in piles of unsold stock, too few and you failed to maximise on the profitability of a successful design. 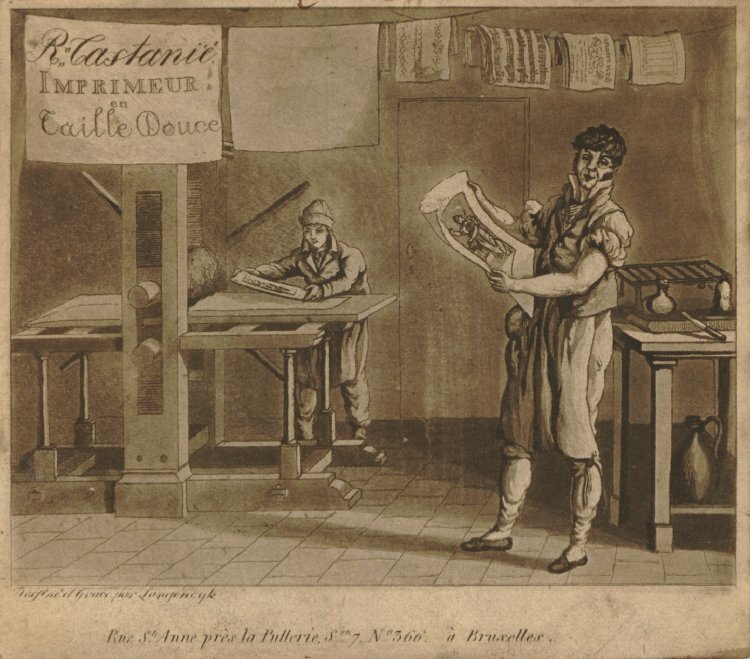 The long list of eighteenth-century printsellers whose business floundered after just a few years of trading indicates just how difficult it was to consistently get this balance right. A. Griffiths, The Print Before Photography: An Introduction to European Printmaking, 1550 – 1820, (London, 2016) pp. 62 – 77. A.M. Broadly, Napoleon in Caricature 1795 – 1821, Vol. 1, (London, 1911) p. 37. 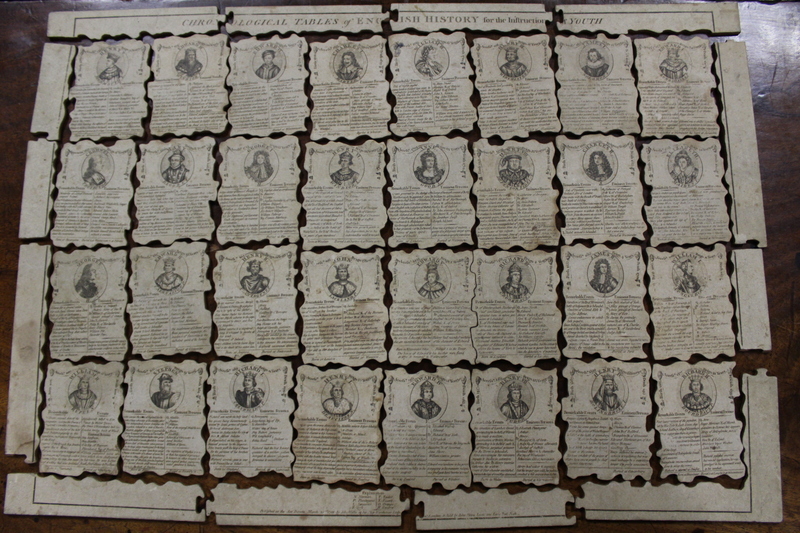 The Lewis Walpole Library has a number of caricatures published by Fores on paper carrying a Whatman watermark. See here and here for examples. See BM Ref. 1851,0901.376. The wording of an advertisement for A Rout which appeared in the Times 20th February 1790 would suggest that it was considered to be a somewhat unusual caricature due to the number of figures depicted. 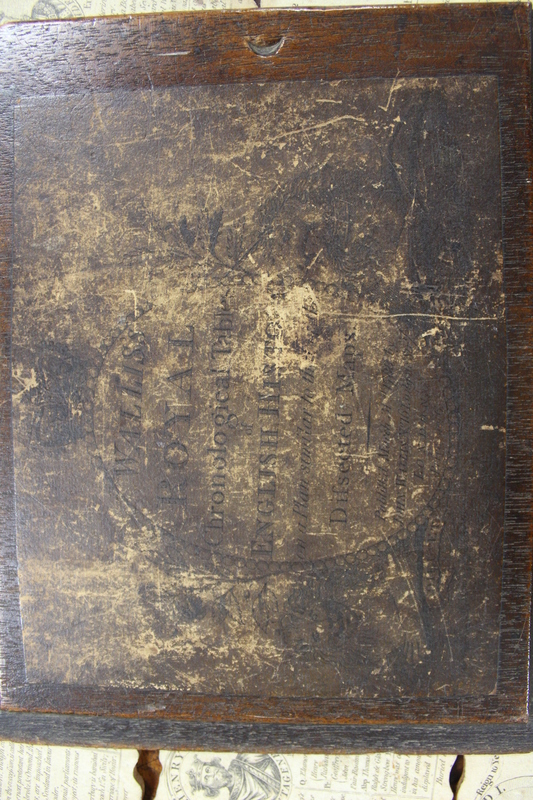 Unusually, the prices of the two prints published in 1786 were etched onto the plates, see BM Cat. 6924 and 6927. 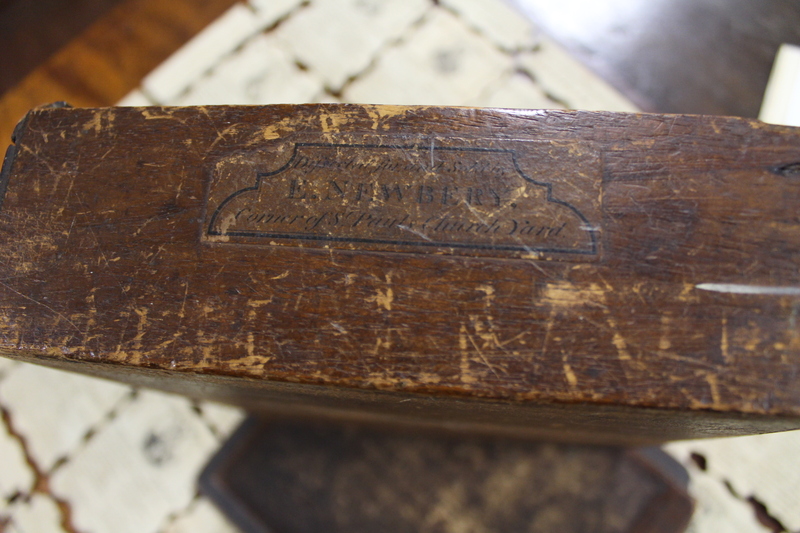 Some readers may remember this post from January 2016, in which I gave a potted history of the career of the copperplate-maker Benjamin Whittow (fl.1750 -1805). 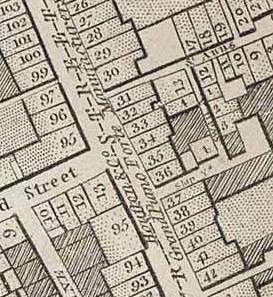 Whittow was one of the principle manufacturers of copperplates for the engraving trade in eighteenth-century London and his wares were used by a range of noted artists and craftsmen, ranging from William Blake to Thomas Rowlandson and Robert Dighton.